Phlebotomy chair casters should allow easy repositioning and lock to secure safety in operation. Techno PC phlebotomy chair / recliners are fully motorized, precisely adjustable, blood drawing chairs - allowing effortless blood donor positioning. Techno PC phlebotomy chair / recliners are also ergonomically designed for ultimate patient comfort and specifically engineered for long-term reliable & durable operation. The Techno PC is our 'flagship' phlebotomy chair / recliner, setting new standards for ease of use and blood donor comfort. The 4 powerful electric motors allow safe, comfortable and precise blood donor positioning at the press of a button on the hand control unit. This 'best in class' blood drawing chair is specifically engineered for long-term, reliable, and durable operation, and can easily be adapted for other medical chair applications. The Techno PC can also be supplied with an available range of custom phlebotomy trays, to fit Your specific requirements. Astridge International Phlebotomy Chair / Recliner From The Competition? We understand the many variables that phlebotomists face, from the range in size of a patient, to the type of equipment used, and the regulations & procedures followed in different facilities. We offer a wide range of blood drawing chairs, featuring different degrees of motor-assisted operation, designed for either 'Stationary' or 'Portable' applications. 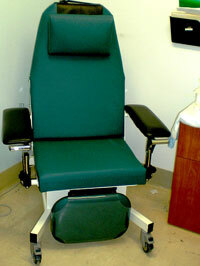 Whatever Your requirements, we can supply the optimum phlebotomy chair to fit them. 'Stationary' blood drawing chairs are designed for permanent medical facility use, whereas 'Portable' blood drawing chairs are specifically engineered for frequent transportation in mobile blood transfusion applications. Regardless of application, every blood donor chair is built around a rigid core of exacting specifications to perform within our phlebotomy chair /recliner design philosophy (see left margin). Frequently, patients or medical staff have special needs. Drawing upon our considerable engineering & design experience, we can usually customize Your phlebotomy chair to meet Your specific needs and comply with all other necessary specifications.